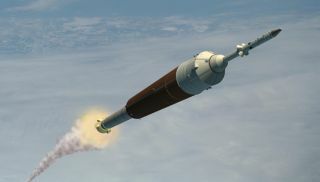 The Orion crew vehicle launches on board the Ares I launch vehicle in this artist rendering. WASHINGTON – NASA's 10 regional field centerslearned Tuesday the roles they will play in developing the Ares 5 heavy-liftrocket, lunar lander, and other hardware the United States needs to send humansto the Moon toward the end of the next decade. The biggestroles were assigned to NASA's larger field centers, with lead responsibilityfor designing the lunar lander and other lunar surface systems, includingrovers and astronaut habitats going to Johnson Space Center in Houston. Developmentof the Ares 5 rocket and its Earth departure stage will be lead by theHuntsville, Ala.-based Marshall Space Flight Center. Marshall will also leaddevelopment of the lunar lander's decent stage. Marshall is already in charge ofdeveloping and testing the smaller Ares 1 rocket which will be used startingaround 2015 to launch the OrionCrew Exploration Vehicle to the international space station. When lunarmissions commence around 2019, NASA intends to use the Ares 1 to launch Orioninto low-Earth orbit, where it will meet up with the separately launched lunarlander for a several day journey to the Moon under the power of the Earthdeparture stage, which is a giant fuel tank with a rocket engine attached. NASA willnot truly begin development of the Ares 5 or lunar lander until after the spaceshuttle is retired in 2010, freeing up some $4 billion a year the agencycurrently spends to operate the 26-year-old spaceship. RichardGilbrech, NASA associate administrator for exploration systems, told a reporterTuesday that although the work would not begin in earnest on Ares 5 or the lunarlander until after the shuttle retires, telling the field centers now whattheir roles will be will help them prepare for the future and, more immediately,allow them to get involved in generating the technical requirements for theneeded hardware. "Thisis an early step to let the field centers know what areas of responsibilitythey can look forward to in the exploration program," Gilbrech said. Theannouncement of the field center work assignments comes as the House and Senateprepare to meet in legislative conference to draft a final Commerce, Justice,Science spending bill for 2008. Among the issues to be worked out in conferenceis how much money to give NASA. The House has approved $17.6 billion for NASAfor next year, while the Senate approved $18.5 billion, a sum that includes a$1 billion cash infusion to help the agency financially recover from the 2003 Space Shuttle Columbia accident. Gilbrechsaid the timing of NASA's announcement was unrelated to the pendingcongressional action the space agency's budget. "Weare here to do a technical mission and trying to go where we have the besttechnical expertise to accomplish that," Gilbrech said. NASA Ames Research Center near San Francisco was assigned lead responsibility for Ares 5's integrated health managementsystem and a supporting role developing its payload shroud. Ames will also leaddevelopment of integrated health management systems for the lunar lander andother lunar surface systems, and work with other field centers to build missionoperations simulations capabilities, NASA officials said. Dryden Flight Research Center outside Los Angeles is currently leading the testing of the Ares 1 rocket's launchaboard system, and will help Ames develop mission operations simulationscapabilities and support ground and flight test operations for other lunarprojects. GlennResearch Center near Cleveland was given the lead for developing the lunarlander's ascent stage – the rocket engine it will use to get off the Moon'ssurface – as well as Ares 5's power system, thrust vector control system andpayload shroud. Glenn engineers will also subject the Earth departure stage tothe rigors of the space environment at nearby Plum Brook Station, which hoststhe world's largest thermal vacuum chamber. GoddardSpace Flight Center in Greenbelt, Md., was assigned the lead for developing anunpressurized cargo carrier for Orion and avionics for the lunar landers.Goddard is also being asked to draw upon its experience designing the toolsastronauts use to service the Hubble Space Telescope to develop tools andequipment NASA's Moon-bound astronauts will need when they do spacewalks.Goddard was also given supporting roles on the development of avionics andcommunications systems for as of yet still to be define lunar surface systems. The JetPropulsion Laboratory in Pasadena, Calif. was given a variety of supportingroles on the lunar lander and the lead on a particular robotic lunar surfacemobility system – a six-legged robot known as All-Terrain Hex-Legged Extra-Terrestrial Explorer, orATHLETE for short. Florida'sKennedy Space Center was assigned responsibility for doing final assembly ofthe human lunar lander, will help integrate lunar habitat modules and, ofcourse, will get Ares 1, Ares 5 and Orion ready for launch from its ocean-sidelaunch pads. Langley Research Center in Hampton, Va., was assigned a variety of supporting roles on the lunar lander as well aslead roles on the Ares 5's aerodynamics and developing structures andmechanisms for such lunar surface systems as the rovers and habitation modules. Stennis Space Center near Bay St. Louis, Mississippi,NASA's primary rocket engine testing facility, will perform that role for Ares5 as well as Ares 1. It will also support testing of the lunar lander descentengine.